You might have noticed this already: we’re always improving our service. Today this also includes our popular Chrome extension. We’ve reached version 2.2.8 now, as you can see in the Chrome web store. We haven’t lost any of the functionality that made this extension powerful and famous, but we’ve added some new features, including the option to save all your open browser tabs as bookmarks. Bookmark multiple tabs with our updated Chrome extension. Our Chrome extension has always been the easiest way to add bookmarks to your start pages. It’s just a matter of clicking the button, editing the bookmark and saving it wherever you want. But what if you’re going to add more than one tab at once? Until now you had to click the extension every single time. Some of our users found this to be a bit annoying and tiresome. They reached out to us, to see if we couldn’t simplify their lives. We decided we couldn’t just do this, but even better: we wanted to! So today we introduce a new option in your extension pane: Open Tabs. Open Tabs makes it possible to add your pages to a new (or existing) widget. Say you’ve started working on a project by doing some research. You open new websites, use DuckDuckGo or Startpage.com or some other search engine, and before you know it you’ve opened ten different tabs at once. Now, let’s say you’re busing looking for just the right piece of information when you realize you have to catch your train. Urgently. There are only a few minutes left before it leaves. Now, you could call it a day, or continue working on your project on the train, just a bit longer. You could close the lid of your laptop and run to the train station, hoping everything will be all right. Or you could click our extension and hit the ‘Open Tabs’ option. Select the tabs you want to save (start.me omits your own start pages automatically) and quicksave your links. Everything gets synchronized in the cloud, so you can shut down your computer and transport it safely to the train. Once you’re there, you open your start page, locate the widget with your saved tabs and open them with one click. Besides the Open Tabs option, we’ve also added two other features we consider useful. We’ve improved the sorting of widgets and pages in your Add to start.me pane. Until now we’ve been presenting the list of your pages and widgets in alphabetical order, but since we don’t limit the number of pages and widgets you can make, this hasn’t been the best option. Especially if you’re a PRO user, you might want a bit more structure. That’s why we’ve now ordered the list first according to your pages, and only then to the alphabetical order of your widgets. If you’d like to find your widgets even faster, you could also use numbers in the title. Add to start.me with a click. A final feature we reintroduce is the feature called Right-click adding. This feature has been included in our extension before, but somewhere along the way, we must have inadvertently dropped supporting it. As we still consider it useful, we just wanted to inform you that it’s back again. 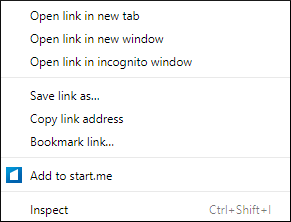 Right-click any link and add it to your startpage: easy like pie. Excellent features! Dank je wel! Is there a way to turn off the “new tab” feature but still use the start.me extension for all the other features? I would definitely use the extension plenty, but I do not like being forced to use the start.me as my new tab page. And I’m sure others using my computer don’t want to see my stuff keep popping up in their way when they are trying to do things. Hi Bethany, not at the moment. We recommend you uninstall our extension (so start.me does not become your homepage) and install our Bookmarklet instead.